This Sotol survived a fire that burned much of the vegetation from the foothills of the Four Peaks area eastern Maricopa Co., Arizona. I have contributed a full resolution photo to Wikimedia where there are other photos of agaves. RANGE: This large succulent reaching 2 meters or more in height, appears in upper Sonoran Desert, chaparral and encinal vegetation types and is popular in city xeriscapes. 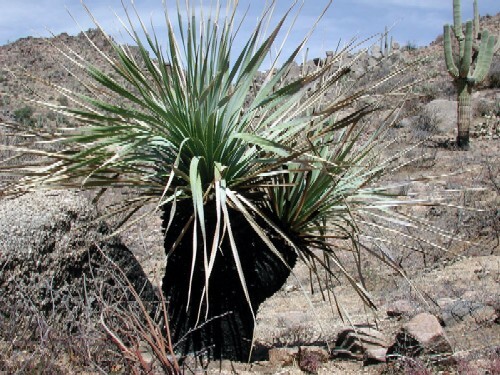 It also a major component of the Chihuahuan Desert. LEAVES: The long strap like leaves are moderately thick and have sharp prickles closely spaced along the margins. The base of each leaf expands abruptly giving a so-called spoon-shape. Sotol leaves produce a resistant and flexible fiber that has been used by the Tarahumara and others in weaving baskets. FLOWERS: Thousands of very small flowers appear on a 2 to 3 meter tall spike each year. They are creamy-yellow in color. SUCCULENT: The central stem stores water and starch which has been harvested and fermented to produce an alcoholic beverage, Sotol.